Having got fed up with fiddling with tiny keys while composing blog posts, I decided to order a MiniSuit Bluetooth Keyboard from Amazon for my tablet. Pretty cheap, easy to set up and it looks good. The biggest downside I’ve noticed so far is the lack of a £ symbol, so I guess I’ll be using the on-screen for that. Also, the CTRL key doesn’t appear to work with ConnectBot SSH client, although that could just be me needing to do some setup. The keyboard both looks good and feels pretty good so far, though I’ve yet to use it in anger. The case design is the same as the rubberised back of my tablet (Nexus 7, 2012) and when attached as a case/screen-protector it looks most professional. It works in both landscape and portrait modes, though landscape is a LOT more stable and makes the tablet look like a 7″ Chromebook. 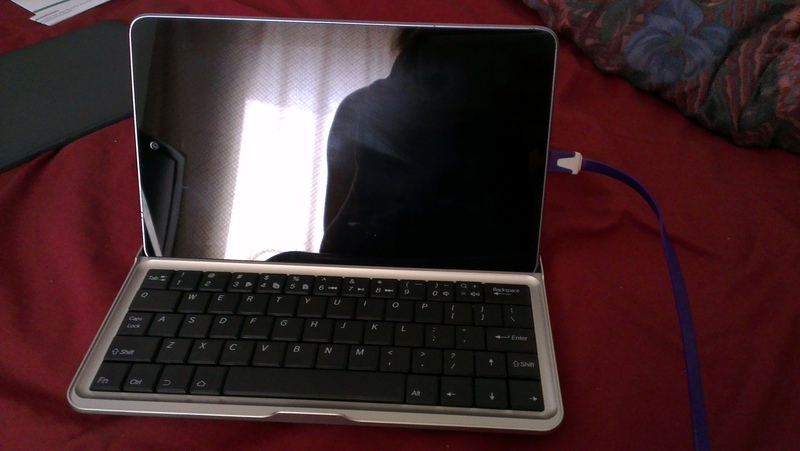 It charges from micro-usb and the Book of Words claims a pretty long run time on the battery. Again, since it only arrived today I can’t say any more than that. It doesn’t charge the tabled, nor will it charge from it. Anything more is for me to find out.